Back in my previous existence as an artillery officer, I participated in the war for a little while. Our main job---my Marines and I---was to provide counter-fire support for units in and around the city of Fallujah, Iraq. Basically, whenever our guys started taking rocket and/or mortar fire, radar would track the source of those rounds and send us their point of origin as a target. Then we would shoot at it. Simple. Kind of. By the time I got to Fallujah, all the dumb bad guys had been selected out of the gene pool; the ones who were left knew that what they were doing was extremely risky, and they took steps to minimize that risk. They tried their best to make every opportunity count, and our goal was to make it just as costly as possible for them to shoot at us. It was a deadly serious game-theoretical problem for both sides. A game measured in seconds. 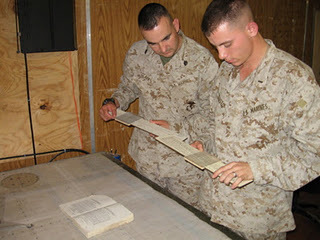 This entry was posted in Math + Musing and tagged artillery, game theory, Marine Corps, math on February 16, 2012 by Chris. I used to be an artillery officer in the Marine Corps, and it's sometimes fun to bring mathematical details of my former life into the classroom. Not only is there some useful and interesting math to be found there, but it also buys me the occasional attention of the Call of Duty crowd. Here is a simple application of Bayes' Theorem to artillery safety. This entry was posted in Math + Musing and tagged artillery, Bayes' Theorem, Marine Corps, math, probability on January 11, 2012 by Chris.